A new Sphere e-learning course will help users gain the skills needed to promote Sphere within their own network and to leverage improved quality and accountability for people affected by crisis and disaster. The one-hour interactive course is aimed at anyone involved in humanitarian action who wishes to better explain the Sphere approach to humanitarian response. Community members, government staff, aid workers, members of the military, trainers, NGO managers and others can learn what is needed to promote Sphere within an organisation and to encourage employers, colleagues and partners to adopt and implement the Sphere standards. 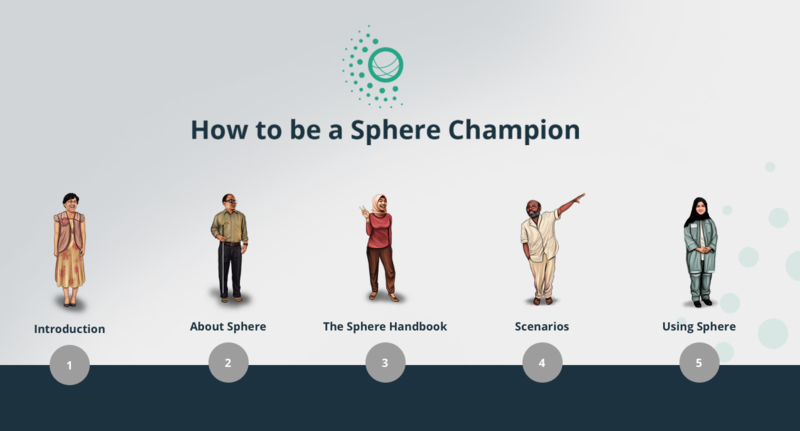 The module highlights some of the key features of the Sphere Handbook, explaining how to best use it in different ways and in different situations. It also introduces the Sphere Approach to humanitarian response. By the end of the course, users gain an understanding of the first steps to advocate for the implementation of the Sphere standards. The module’s underlying concept is the belief that anyone can become a Sphere Champion within their own organisation or network and make a concrete difference in the quality of the humanitarian assistance provided. The course is available on the Sphere website. Sphere is grateful to Sphere trainers and Champions Dwi, Illiassou, Gopal, Amna and Magdalena for agreeing to appear in this course and associated materials.